The Baynhams: Imagine a bargain! I went grocery shopping the other day. I wanted to make a monster lasagna and had my list of things to buy. 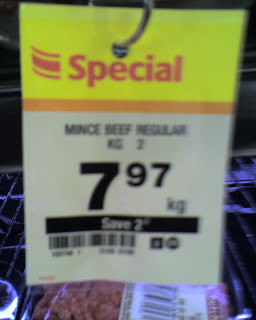 I like my bargains so imagine my delight when I saw that minced beef was on special. Imagine my disappointment when I saw that the shelf was empty. Imagine my relief when the young butcher assistant offered to go make me up a tray while I waited. Imagine my incredulous face when I looked closer at exactly how special the special offer was. Wow! 2cents a kilo off! Imagine me now furtively looking around to check no one was looking then reaching into my pocket for my mobile phone to sneak a quick photo of the tag so I could have a giggle sharing it with you. Imagine how red my face went when I realised that the young butcher boy was standing behind me, tray of mince in his outstretched hands and a look of "what are you doing" on his face. Imagine me running as fast as I could away from the meat counter, red faced, mince in my trolley and blurry photo captured on my phone!! !